In a year where we could make a case for firing half of the leagues head coaches, there were several managers who elevated their game this season. Let’s take a look at the candidates for NFL Head Coach of the Year and hand out our award. One of Doug Pederson’s first decisions in Philadelphia was to give rookie Carson Wentz to starting job in week 1 after trading away Sam Bradford to the Vikings. That decision seemingly has paid dividends in year 2 as Wentz led the Eagles to an NFC East division title and a first round bye. I understand Wentz hasn’t played the last 2 weeks, which is even more of a testament to the Eagles coaching as Philly is 2-0 in those games. As the Eagles look to break a historic Super Bowl drought, Doug Pederson has them trending upwards in the crowded NFC. It is amazing to me to think a guy who is 18 months older than me is a head coach in the NFL. Growing up, head coaches were always old guys with balding hair who had been in football for decades… Siefert, Mora, Holmgren, Coughlin etc. Now, it’s the young guns turn. Youth before experience and all for it. In the new NFL era of instant gratification, you need that spark and that niche that nobody has seen yet. I rope McVay in with Kyle Shanahan in San Francisco. McVay captured an NFC West division title, their first since 2003, in his first year and was greatly instrumental in the quick development of starting QB and 2016 #1 pick Jared Goff. The sky is the limit for the Rams in a division where the Seahawks seem to be taking a step back, the Cardinals are probably headed toward a rebuild, and the 49ers may be a draft or two away from truly being a competitor. When Mike Zimmer headed into this NFL season, I can’t imagine he felt too confident that Sam Bradford would last an entire 17 weeks. And who could blame him, Bradford has given little evidence to the contrary. So the team went out and picked up Case Keenum and Latavious Murray, drafted Dalvin Cook and coupled them with a fantastic defense. It was enough to win the NFC North and a first round bye. He looks to guide his Vikings to the Super Bowl right in his own backyard. The Jaguars are the feel good story of the year with a scary good roster. Not many people had Jacksonville penciled in as their AFC South champions, but then again it wasn’t the greatest division to start with. 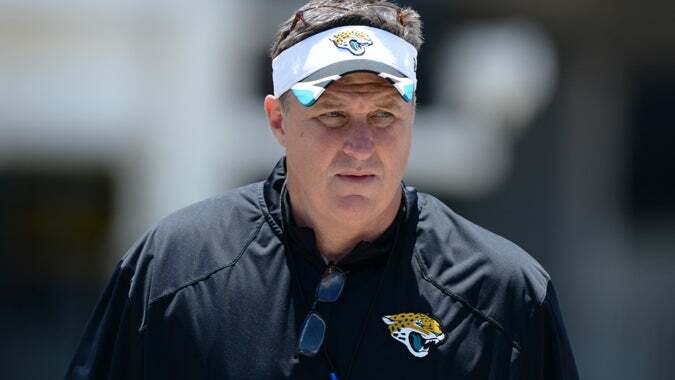 Nevertheless, Marrone guided the Jags to a south crown beating the likes of Baltimore, Pittsburgh, LA Chargers and Seattle along the way. Blake Bortles has been better but not great in the final year of his rookie contract. The defense has been spectacular and they’ve gotten a great rookie season out of Leonard Fournette, despite his absence in a few games this season. 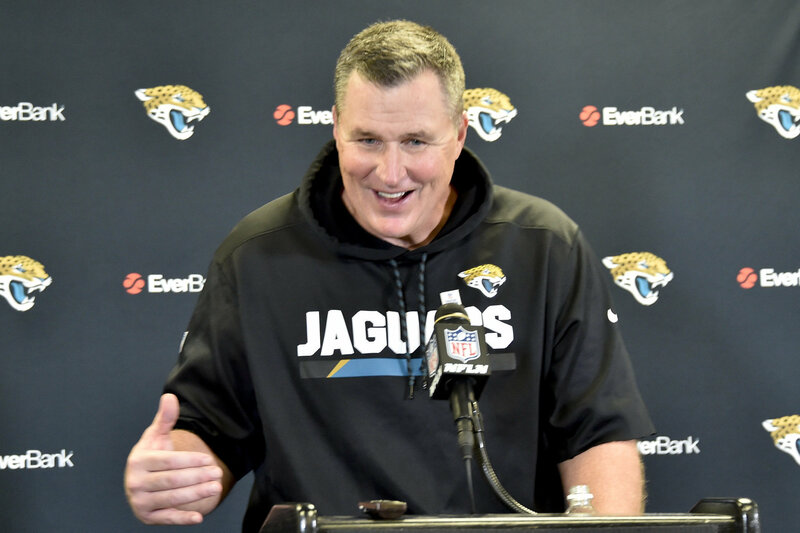 Many playoff teams have been on the record saying they don’t want to face Jacksonville in the playoffs, and that speaks volumes considering the Jaguars have only won 17 games in the last five years. Our first impressions of Sean Payton and the Saints this season was an 0-2 start and a sideline spat with now ex-Saints running back Adrian Peterson. Everyone said AP was crucial to their running game this year, except Sean. Sean decided to stick with his heisman horse Mark Ingram and a little known 3rd round pick by the name of Alvin Kamara. He shipped Peterson off to Arizona, where AP has been mediocre, at best. Turns out Payton strikes gold…again. A down year for Drew Brees, by Brees’ standards, turned out to be alright as Ingram went for over 1000 yards and Kamara has emerged as the most versatile back in New Orleans since Pierre Thomas. Sean and the Saints are playing week 17 for the NFC South division crown but have already locked a playoff spot, going 11-2 in weeks 3-16. Bonus football in New Orleans is always fun and Payton is one of the best game plan developers in the league.